These days everything has to connect to the Internet in some way. Whether it be your washing machine letting you start a cycle from an iPad or the fridge pinging your phone when that carton of milk you forgot about has gone off. One of the most popular and common pieces of smart home tech so far is the thermostat. That dial that you use to control the temperature in your house has been taken into the hearts of manufacturers and turned into something rather futuristic. So far we've seen Hive, which is currently pedalled by British Gas, Tado and Netatmo, but ever since Google purchased Nest Labs in early 2014, it's Learning Thermostat been the one to beat. So, let's see if version 3.0 keeps it in front of the competition. 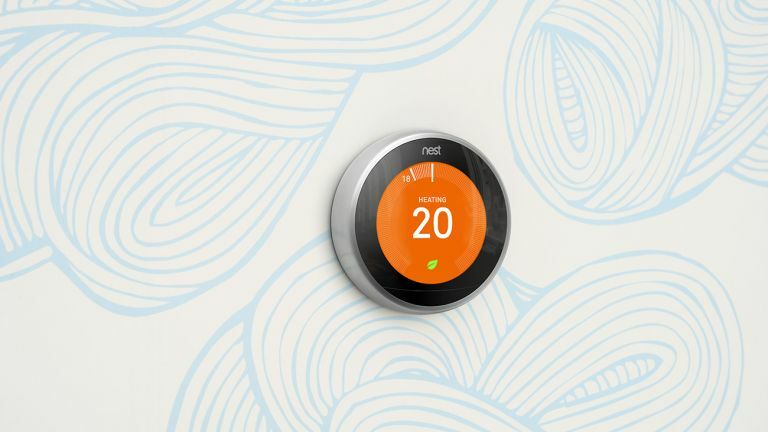 The Nest Learning Thermostat is the brainchild of a man once dubbed the father of the iPod, Tony Fadell, so it's no surprise it wins out in the style stakes. Just like Apple's original music player took something that was typically fairly bland and made it a style icon, Nest has done the same with the thermostat. Constructed from a mixture of glass and metal, the 2.7cm thick device is easily the most beautiful way to alter your heating and possibly the slickest home connected gadget yet. The front slightly curves, adding more class, and a circular, sharp 480x480 LCD sits bang in the centre. Just like your typical thermostat, the body can be twisted either forwards or backwards to alter the heating and also navigate menus, while pressing it down selects the option. The rotating motion is smooth and slightly weighted, which adds a pleasurable tactility to using it. Over the years it's become thinner and the screen larger, making it even more desirable. And while Hive's aesthetic design has come on leaps and bounds of late thanks to Yves Behar, we still think Nest is still the best-looking smart thermostat out there. The circular theme from the body carries over into the software and it creates an intuitive experience. You cycle through the menus with a twist, selecting with a push, and for the most part, the software is exactly what you'd want. It's simple, heavy on big icons and text is kept to a minimum. The device will pop into life as you approach, displaying the current temperature. This also lets it know you're in the house, so it'll pump up the heat if it knows you like it hot. While the simple tasks are easy to complete, more complex things, such as trying to set the schedule up on the unit is tiresome, full of turns and pushes and deleting what you just did and then trying to do it again. You're best off using the mobile or browser apps (we'll talk more about this later), or take advantage of the 'learning' part of this Learning Thermostat. Nest 3.0 can also control your hot water, setting schedules to optimise water usage and further cut down bills. So, how exactly does this unit learn? Well, after about a week of using it, we found that we didn't really need to set-up another manual schedule, it just started automatically switching on to the temperature we normally set it to in the morning, switching off in the day when we were all out and ensuring it was back on again in the evening. Obviously, this does have some shortcomings, especially if you live in a multi-person house with everyone coming and going at different times. But, you can always manually change up the temperature, so it's still nice to just forget about it all and get on with your day. While you can just buy the thermostat on its own, have it delivered and attempt to wire it to your boiler yourself, Nest recommends that you have it professionally installed, so you don't accidentally damage something you shouldn't. Handily, they offer a version including installation, so no need to hunt through the Yellow Pages (or the web?) to find your local electrician. Installation was easy. For us, anyway, as the electrician took care of the tricky bits, meaning all we had to do was set up a Nest account and, well, that's it. You can download the app, login and you're set. We've mentioned the mobile apps a couple of times already and they're quite an important part of the whole setup. Official versions are available for iOS (that's iPhone and a formatted iPad version too) along with Android and then one accessible from your browser. Whichever version you choose, the experience is pretty much exactly the same, from the functionality to the design. Open up the app and you're thrown right into an interactive thermostat displaying the current temperature. Scrub up or down to alter it, or tap directly anywhere on the dial to jump to that temperature. Swipe in from the right to access a couple more options, including setting up your manual schedule, turning off the thermostat completely and general settings. Here you can set your away temperature (so, when you're not in the house, it'll always aim for this) and a couple of other bits. The other option is Energy History, which summarises your usage over the past week. It'll tell you how long you had the heating on for, your average temperature and so on. Tap on the specific day to dial deeper and you can even see the exact temperatures you were on, for how long and when you were away. The apps are all very simple, but then the whole idea of this system is that it's meant to be simple, so the lack of settings and options is to be expected. In reality, though, all you really want to do from the app is quickly change the temperature wherever you are (it'll work on both WiFi and data connections) and be able to easily amend and create schedules. Both of which it does with ease. There are some great features Nest has packed into the Learning Thermostat, but it is basically just a dial that changes the temperature in your home. How does this work with the larger 'smart home'? Works With Nest is a range of products which, err, as the name suggests, work with Nest. For example, you can combine a Jawbone UP 24 and the thermostat. Now, whenever you wake up in the morning or fall into a slumber at night, the fitness band will ping and alert the thermostat to alter the temperature accordingly. There are loads of other partners too, including Whirlpool, Phillips Hue bulbs (another smart home favourite) and even a few Mercedes Benz cars. Has this really taken off? Every time we've seen Nest in the past year or so, they tell us one in five users use Works With Nest. That means four in five don't. Probably because having your thermostat connected to things isn't really that useful. That doesn't mean Nest's other products are bad, the Nest Camera is great, as is the Nest Protect smoke alarm. But they're quite nebular. Apple HomeKit and Samsung SmartThings make more sense as smart hubs. The Nest Learning Thermostat is both a futuristic device and a familiar one. It has that element of connectivity, with mobile apps, but it still feels like a regular thermostat. Everyone knows how to turn the dial, so even if the apps aren't at hand, it can still be used. It fitted into our daily routine almost instantly, which is a ringing endorsement and it's the first time we can really say that about a smart home gadget. The learning portion of the device works quite well. Since having it installed, about two years ago, we've only suffered one major issue with the unit going offline with no real reason, but it eventually corrected itself and nothing similar has happened since. If you're looking to take the first steps into creating a smarter home, the Nest Learning Thermostat is a great starting point, and the future bright, especially is Works With Nest can find some productive uses. Hey, check out the best smartbulbs!